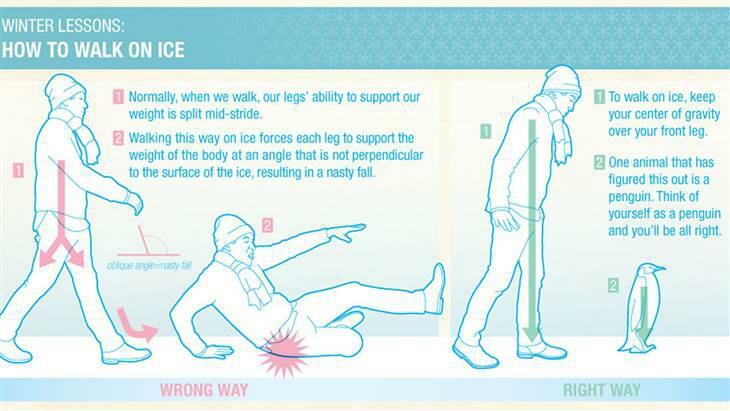 Walk like a penguin! According to the Centers for Disease Control and Prevention walking like a penguin on icy or slippery surfaces is key to getting across these surfaces safely. You need to position your feet so they are slightly pointing out like a penguin. Walk flat-footed, bending slightly to keep your centre of gravity over your feet, put your arms out to your sides for balance, and walk slowly. Shuffling or taking short steps is also recommended for stability. In addition, you should ensure that you are wearing appropriate footwear for the weather conditions. You need to wear boots with good traction. Be sure to stay on designated walkways, and use railings when ascending/descending stairs. Don’t forget to give yourself extra time to walk to your destination to ensure that you are not in a rush and can take the care that you need to while walking on slippery surfaces. In the event that you do slip and fall and injure yourself, it is important to take pictures of the area in which you fell as soon as possible thereafter. If you have fallen on the sidewalk or possibly municipal or provincial property, you have an obligation to advise the municipality/Province, in writing, within 10 days of the incident. If you fail to put the municipality/Province on notice within 10 days of your incident, you may be statute barred from pursuing a claim for your injuries, unless you have a good excuse for not doing so.